You might not be surprised that there’s a murder in this film -- after all, it’s Mystery Month here at Movie Churches. But the victim in this film isn’t some crappy old millionaire or a blackmailer or a widely hated jerk, the kind of people that are suitable casualties for a British cozy murder mystery. In this film, the first to die is an adorable little girl. Not just any adorable little girl dies, though. We’re talking ten-year-old Brooke Shields. Don’t say I didn’t warn you. 1976’s Alice Sweet Alice was titled Communion when it was being shown at film festivals. The name was changed to Holy Terror when it was released in 1981 to capitalize on Brooke Shields’ newfound notoriety. Both alternative titles acknowledge the religious content in the film, though the Alice title doesn’t. Marketers may have been leary of the religious content, but it’s there. 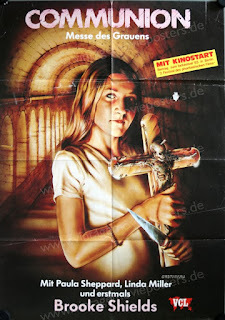 The film has a mystery; it is a whodunit, but it is also a horror film -- a “slasher” film -- in a religious setting. The little girl, Karen, is killed in a church as she’s about to receive her first communion in a Roman Catholic Church. The priest is a major character in the film. Is he the killer? Could it be one of the nuns? The chief suspect, though, is Alice (Paula Sheppard), Karen’s older sister. Before the murder, Father Tom (Rudolph Willrich) comes to the Spages home to celebrate Karen’s upcoming first communion. He kisses the girls’ mother, Catherine (Linda Miller), on the cheek when he enters and kisses the two daughters. He gives Karen a wrapped gift. She opens it to find a golden cross. Karen throws her arms around the priest saying, “I love you, Father Tom, I really love you!” Alice watches this all sourly. She is apparently the bad sister. She steals Karen’s doll and threatens to break it. She locks Karen in her room. She terrifies her sister by wearing a scary mask, which leads to the murder scene, the church. It is an old, red brick building. “Soul of My Savior” is sung by the congregation. 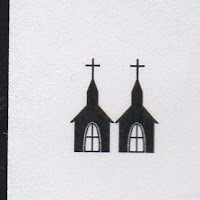 Catherine knells and crosses herself as she enters the church, and we see many children dressed for First Communion -- the girls all in white -- led by the nuns toward the sanctuary. Karen is the last in line. A mysterious figure in a mask grabs and strangles her, dragging her away and putting her in a black box. The cross Father Tom gave her is ripped from her neck and a lit candle is thrown into the box. Alice enters the sanctuary and tries to go forward for communion, but a nun smells smoke from the side room. Her screaming interrupts the service, so there is no communion for Alice. Karen is found dead, and Alice doesn’t seem particularly upset when she learns of her sister’s death. As the police investigate, they interview Father Tom, meeting also Mrs. Tredoni (Mildred Clinton), the housekeeper of the home for the priests. Several priests live together, including a wheelchair-bound bishop who seems to be senile. Father Tom isn’t much help with the investigation. Not surprisingly, more mayhem occurs, and many begin to suspect that Alice is responsible. Her mental health begins to be questioned. Father Tom brings comfort and counsel to those who are attacked and traumatized, and he offers to take Alice to a mental institution. But here comes the big spoiler, the answer to the mystery, and you have been given warning to not read further if you don’t want know in advance the identity of the killer. It isn’t Alice. It’s Mrs. Tredoni the housekeeper. She remembered the Scripture that says the sins of the fathers are visited on their children, and she believes it is her job to see to it that happens. She killed Karen to punish Karen’s parents for their sins, but then she keeps killing to cover her crime. The conclusion of the film takes place again at the church. Father Tom learns the identity of the true killer. Mrs. Tredoni comes forward for communion, as does Alice. The priest refused his housekeeper communion because, well, she’s a killer who has not confessed. He also refuses Alice, because he doesn’t seem to like her attitude. Police enter the church to arrest the murderous housekeeper, and she stabs the priest. He dies in her arms. 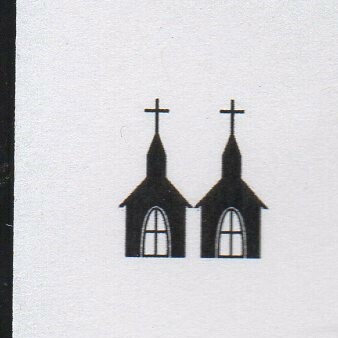 So, at least Tom the priest isn’t the killer, which would have drastically impacted his Movie Churches Steeple rating. But he seems to show favoritism between parishioners, even between Karen and Alice. And he and the other priests in the house didn’t seem to teach their housekeeper very good theology, if she didn’t know that God doesn’t generally call people to murder. So we’re giving Father Tom and the other priests and nuns of Alice Sweet Alice a very meager 2 Steeples.